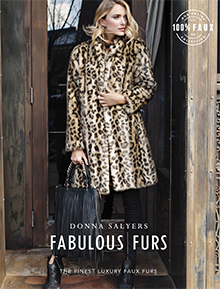 Donna Salyers Fabulous-Furs is the industry leader of faux fur coats and jackets, faux fur throws and pillows, and home décor! 100% Faux. A luxurious cruelty-free alternative to real fur. Enter promo code - FFCATLOG - at checkout on the Fabulous-Furs website.